The game is in full swing now as we launch Part 2 of our Wimbledon Picnic Blanket CAL. Download your copy of the second pattern instalment here. If you missed the first instalment, don't despair! Download Part 1 now. 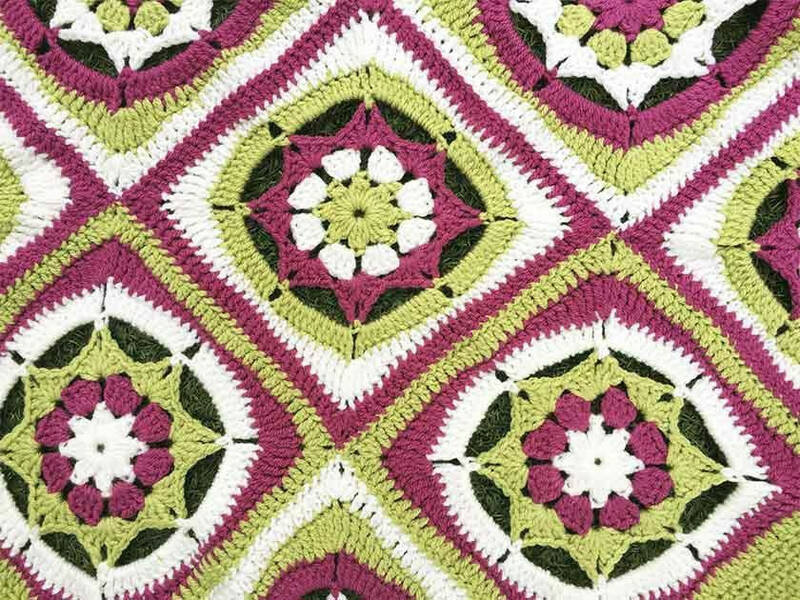 The 'first serve' of our CAL got you started on the inner rounds of the mandala blanket. Some of you seemed to manage it without too much trouble. Teresa kindly shared a photo of her progress on our Facebook group. Fellow crochet enthusiast Andrea was also keen to let us see her work so far. Looking incredibly neat and consistent, ladies! We can't wait to see how you get on with our next set of instructions for more variations of treble stitches coupled with double crochet and chain stitches. Let's begin the middle of our mandala motif with our easy Part 2 how-to photo guide. Join in yarn in any chain space. Work a treble stitch into the same chain space. Wrap yarn around hook and pull through first two loops on hook. Yarn round hook and bring through remaining two hoops on hook to complete the treble stitch. Work another to complete first group of trebles. Then do three more treble stitches in the same chain space. Then miss four trebles from the previous round and insert your hook into the next chain space. Continue in the pattern: three trebles, three chains, three trebles in same chain space. There are no stitches worked between chain spaces, simply begin in the next chain space after working your pairs of trebles. Work all the way round until every chain space has been worked in. Slip stitch in the third of three chain stitches to seal. Join the next colour into any chain space. Work a double crochet (dc) in the same chain space. Then do your chain stitches as stated. Miss 6 trebles from the previous round and work a dc in the next chain space. Keep working your way round into all the chain spaces. Slip stitch in first dc. Slip stitch in first chain space. Three chains count as your first stitch. Work 10 trebles in this chain space. Do one chain before working 11 trebles in each chain space. Slip stitch in third of three chain. Next pattern to be released on 7 July!